I’ve been working on my DDS thing, and I’ve done this before. I got to a certain spot and set it aside because I didn’t know where to go next. But now I’m back and I have an end goal: adding RIT to my SS-40 QRP radio so that I can use it for the 40 Meter fox hunt. And I am doing that by replacing the analog VFO with a DDS. 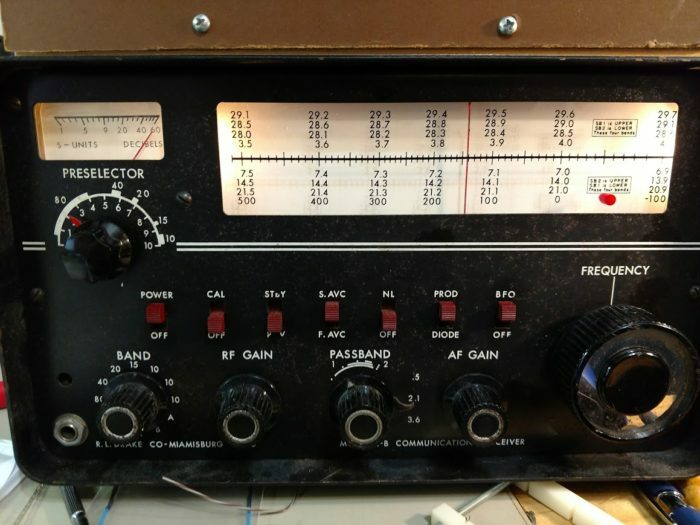 I’m spending some time thinking about radio user interfaces. Let’s imagine a situation where someone hands you a “control” and tells you to “move the zingle to 12 by snoggling this gizmo-whitz.” So you take the thing in your hand and you see it has a little indicator showing a 3 digit number now saying “73.2” and four buttons labelled with arrows. What do you do? Now imagine the indicator is a horizontal ruler dial with labels on marks incremented in 5’s from 0 on the left to 100 on the right. There is a red colored vertical needle sitting slightly above 35. And again there are four arrow buttons. What do you do? How about when the display is a digital number but the control is a knob? Do you turn the knob left, or right? What does “left” or “right” even mean when you are twisting a round thing?? Pragma #1: The expected effect of a wheel control is by the relative motion of the “top” of the wheel. I have another radio, the Drake 2B receiver, with a big rule-dial and a vertical red-line indicator. It has two controls for determining frequency: band switch and big knob. The band switch selects what band and the big knob moves the red line left and right. [The movement of the top of the knob corresponds to the left-right of the red line!] One tricky thing is the dial shows frequency increasing left-to-right on some bands and right-to-left on other bands. All of the bands going one way are above the ruled line and the all of the bands going the other way are below the line. The band switch is a “jump” control. You can imagine a very long dial from 3.5 to 28.5 and a big knob and you turn the knob round and round and round and round moving the red line all the way, yards and feet and inches.. .to get from one end to the other. The radio doesn’t actually work in the intervening frequencies, only in these little “windows” into the whole range of possibilities. So the band switch jumps you to a section of the whole spectrum. Definition 1: Moving a knob to get from one frequency to another is driving. You start at the current spot and you go “up” or “down” from there in a relative sense until you get to where you want to be. You may be looking for a specific number, or listening for a signal or otherwise getting feedback that lets you know when you get there. Definition 2: The band switch is more like flying: you plop into another range of operation, like flying into the airport from which you then have to do driving to make localized changes. When digital displays enter the picture you have a third form of interaction arise: direct number entry. With a calculator, keyboard or phone keypad you just “punch in” the numbers. Sometimes it is all aural like my little QRP radio which has no visual indicator at all. I just turn the knob and listen for signals. I hear one, I adjust to make it sound good and that is all. I am happy with that until I go to record our frequency in my log book and all I know is that we were somewhere between min and max. Or if you tell me to “meet me at X” and I spend a lot of time searching up and down, up and down, not knowing where X is, not so happy. For the fox hunt, I want some of each. I have a range of frequencies between which the fox is operating, and I can hear fainter signals by tuning across them. This is morse code, so each signal is a little eeeeee. As you tune the note of the beep goes up or down. The change in note makes a faint signal stand out from the shush of the noise that is always in background. Radio guys say that a faint signal is “in the weeds”. There is always a lot of signal but most of it is continuous shushshshshshshsh. You tune through and you hear shshshshshshsheeeeeooooohohohsshshshshshshshsh And you had yourself a signal there. So I want mostly driving but a little bit of feedback about where I’m driving.